Researcher, Grant Cameron, who runs the website HillaryClintonUFO.net, was able to retrieve documents through the Freedom of Information Act that showed Rockefeller was soliciting help form Hillary’s staff on drafting a document to President Bill Clinton in 1995. The title of the document was: Lifting Secrecy on Information About Extraterrestrial Intelligence as Part of the Current Classification Review. 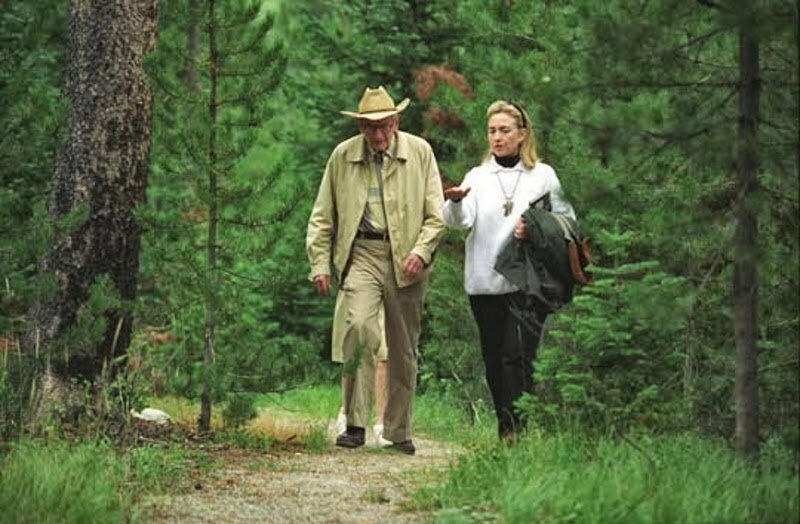 In August of 1995 the Clintons made a trip to Rockefeller’s JY Ranch near Jackson’s Hole, Wyoming. Many speculate that UFOs and ETs must have been a subject of conversation during the visit. However, there has never been any proof of this, until now. In these famous pictures of Hillary and Rockefeller walking on a wooded path during the visit, Hillary is holding a book. For years researchers have been trying to figure out which book she is holding, to find out if it would provide clues as to the nature of their conversation. Finally, Tonio Cousyn (known as elevenaugust at Open Minds Forum) has figured it out. He discovered that the book is Paul Davies’ Are We Alone? Philosophical Implications of the Discovery of Extraterrestrial Life. The images below show how he discovered this. Close up of the book in Hillary Clinton’s arm. Click the image to go to a book cover comparison created by Tonio Cousyn. Paul Davies is a theoretical physicist, cosmologist, astrobiologist, and award winning bestselling author. He is currently director of the Beyond Center of Fundamental Concepts in Science and co-director of the Cosmology Initiative at Arizona State University. He even has an asteroid named after him. He has often written about the SETI project, and the philosophical ideas behind extraterrestrial contact. In November of 2009, he was a speaker at the Vatican’s Pontifical Academy of Sciences’ Study Week on Astrobiology event. Although we do not know whether Hillary brought the book or if Rockefeller gave it to her, it does confirm that extraterrestrial life was part of their conversation.